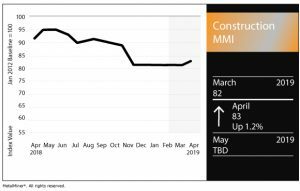 The Construction Monthly Metals Index (MMI) moved up one point to to 83, up from 82 the previous month. According to the U.S. Census Bureau’s monthly construction spending report, U.S. spending in February reached $1,320.3 billion, up 1.1% from the revised January spending estimate of $1,307.3 billion. The February spending total was also 1.1% above the February 2018 total of $1,305.5 billion. Drilling down by category, spending on private construction hit a seasonally adjusted annual rate of $994.5 billion, up 0.2% from January’s estimate of $993.0 billion. Residential construction spending was $540.9 billion in February, up 0.7% from January’s $536.9 billion. Nonresidential construction was $453.6 billion in February, down 0.5% from January’s estimate of $456.0 billion. Meanwhile, public construction spending was $325.8 billion, an increase of 3.6% from January’s estimate of $314.4 billion. Educational construction was at a seasonally adjusted annual rate of $76.3 billion, up 0.8% from January’s estimate of $75.7 billion. Highway construction was $111.1 billion, up 9.5% from January’s $101.5 billion. After a hot January, billings growth slowed in February, according to the monthly Architecture Billings Index (ABI) report from the American Institute of Architects. The February ABI came in at a value of 50.3, down from 55.3 in January (the strongest value in over two years). An ABI value above 50 indicates billings growth. By region, the South led the way with an ABI of 58.3, followed by the West (51.6), Northeast (51.5), Midwest (51.3). Despite relatively minimal growth in February, the report indicates stronger billings growth may be on the horizon, if project inquiry levels are any indication. While billings growth remains on the positive end — despite it being less robust in February — concerns are mounting about the prospect of an economic downturn, not just in the U.S. but in major economies around the world. This month’s ABI survey polled industry members about the economic indicators they most frequently look to for guidance on the general direction of the business climate. According to the report, 25% of respondents said interest rates, while 24% said stock market trends and 23% said business confidence scores. 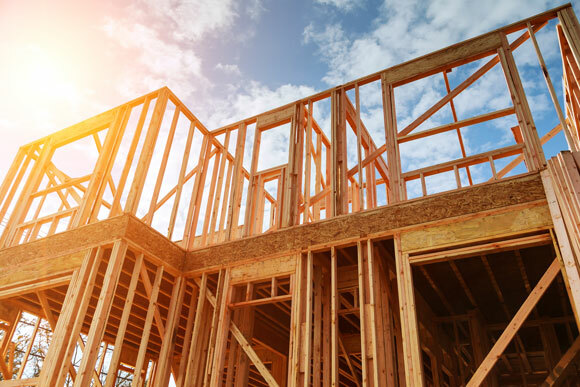 As previously noted, U.S. housing starts fell 8.7% in February compared with January data, according to a recent joint report by the U.S. Census Bureau and the Department of Housing and Urban Development (HUD). On a year-over-year basis, February’s 1.16 million starts marked a 9.9% decline from February 2018. The next housing starts report is scheduled to be released April 19. The Chinese rebar price rose 1.2% month over month to $573.53/mt as of April 1. Chinese H-beam steel dipped 0.3% to $563.10/mt. U.S. shredded scrap steel held flat at $332/st. European commercial 1050 sheet aluminum rose 1.5% to $2,642.27/mt. Chinese aluminum bar rose 1.0% to $2,207.70/mt, while Chinese 62% iron ore PB fines dropped to $78.21/dmt.